let's make a simple model... Draw a right triangle ABC where A is the position of your eye, B (right angle) is the foot of the object, and C is the top of the object. BC=1 foot, the height of the object. 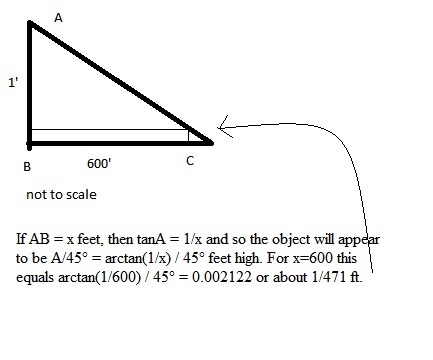 You are saying that if AB=1, then angle A, which is the resulting angle taken by the image (45° or pi/4 rad) will make the object appear 1 foot tall. We need to assume something else, that the apparent height of the object is proportional to angle A, the angle it uses in our field of vision. If AB = x feet, then tanA = 1/x and so the object will appear to be A/45° = arctan(1/x) / 45° feet high. For x=600 this equals arctan(1/600) / 45° = 0.002122 or about 1/471 ft.
1/471 of a ft is really small! About .03”…. Again, if you want to visualize that, chop an inch into 100 equal pieces - .03 of an inch is 3 of those slices, laid end to end.